If you're looking to liquidate a large quantity of office furniture, including cubicles, desks, tables, chairs, filing, etc., then you've come to the right place! Check out below for more information. This applies to you if you have one or two furniture items or even just a handful that you'd like removed. We specialize in larger inventories, so choosing to sell your furniture on Craigslist or donating it to a local charity may be a better solution. 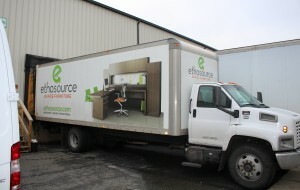 As a new office furniture company starting in a one room office back in 2001, EthoSource’s very first sale was an office liquidation. 17 years later, our company is a nationally recognized leader in the field of used office furniture liquidation and project management. For companies planning to relocate, reorganize or upgrade their existing office furniture, our Corporate Liquidation Professionals specialize in the purchase, dis-assembly, and removal of all types and brands of excess furniture. EthoSource strives to provide our corporate clients with maximum value, turnkey solutions and smooth, trouble-free office liquidations that are completed on schedule. EthoSource is your nationwide office liquidators. We invite you to meet our office furniture liquidation team. Provide Low-Cost Solutions for your existing office furniture that provide all the necessary tools to fit your company’s need and save you money. Removal of all styles and types of office furniture including cubicles, desk sets, chairs, tables, and much more. Our Professional Project Management team will ensure a hassle-free experience by handling all aspects of any size project, no matter how large. We handle the Logistics involved in providing all the necessary solutions for your liquidation in the time frame you need. We have never missed a deadline! We’ll actively manage Office Moves by handling the removal, delivery, installation, transportation, and reassembly of office furniture. If you are a Mover or a Dealer looking for nationwide office liquidator services for your customer, contact us today to learn about what EthoSource can do for you.